Colleen Hoover gutted me. I'm feeling completely emotionally drained after reading this novel. As with many of her prior books, I didn't read the blurb because I wanted to be surprised. I was ready to fall in love with the story but I was not expecting the amount of emotions it made me feel. 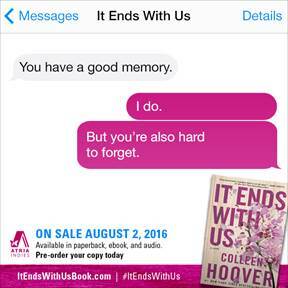 It Ends With Us is the furthest thing from a classic love story. However, this doesn't make it any less powerful or deep. I know this book is going to be with me for the rest of my life. I will never forget it. That's how good this writer is. I know I can pick this book up and start rereading it at any time. There are so many things I love about this novel and their main characters. It was easy to fall in love 15-year-old Lily as it was to fall in love with her when she was twenty-three. I was able to feel all the emotions she went through: happiness, despair, sadness, self-preservation and immense love. Yes, she falls in love twice and she has her heart broken both times. "Where is a marine grade polymer chair when I need one?" The male characters were the same. Atlas Corrigan, the young man who his love for Lily was always present. It was pure and real. He was dealt a bad hand at eighteen but he was doing the best he could with his life. Meeting Lily only convinced him that there were good people in the world and not everything is lost. Older Atlas was everything a woman should want and should get. Ryle Kincaid, how can someone not fall in love with you! From the moment Lily met you, just after one interaction, I was swooning over you. You did weird things to my heart and I'm glad in the end you did what was right for Lily. As for the secondary characters, Marshall and Issa were amazing. They were so good together, that I wish they had their own book. I'm glad they had "people" for almost everything while they still had time to be adorable. I'm so overwhelmed by the feelings It Ends With Us brought me and I think this book could not have been easy to write for CoHo. I feel so thankful that she did write it and was willing to share it. I'm sure this is going to help women who need it the most. 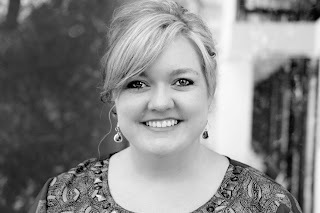 I am a devout Colleen Hoover fan, and when I day devout I mean DEVOUT! As in I have multiple copies of all of her books, even foreign editions, I will travel to see her, and I stalk her on social media daily! Ok I know I'm rambling and I'm sorry! That being said, when I heard about It Ends With Us I decided I wanted to go into it completely blind. I didn't read the synopsis and stayed far far away from any possible spoilers. I tried to prepare myself for this story, but nothing could prepare me for what I would feel while reading it. Colleen has this way of writing that puts a spell on me, I go into some sort of trance, nothing else matters during the time that I'm reading and this one was no different. This isn't the normal love story that we are used to getting from Colleen, not at all! There is so much more to it than that. I instantly loved the characters. Lily, Ryle, and Atlas are such tormented characters, each in their own way and it makes me want to wrap them up in my arms and soothe them. I've learned that that is usually the case with the characters that Colleen gives us. While I'm reading about Lily's new relationships, I'm also reading about her past ones. There is a story within a story that are artfully entwined together. There is such a powerful message that is being told throughout this story and Colleen told it exquisitely! I felt her emotions leaking through the pages and seeping into me, and once the tears started they wouldn't stop because this story is such an agonizing one. There were so many hard decisions these characters had to make and I was there with them each step of the way. With all of the powerful stories that Colleen has written these past few years I feel like this one might be my favorite one yet. It had me squirming in my seat with anticipation. I am completely and utterly gutted! I am raw with emotion that I can't seem to contain. Lily, Ryle, and Atlas will be with me for a long long time. This review won’t be long. It won’t go into detail about the plot and it won’t contain information about why I loved the book. This review is just here to tell you to read the book. The day I bought my first iPad, I immediately searched through the B&N website. That’s the day I discovered Slammed. At that time I had no idea what indie books or indie authors were. I read the synopsis and decided to buy it. When I was finished I was blown away. 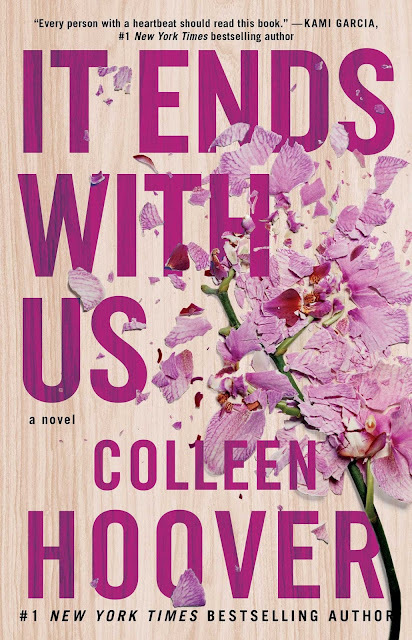 I looked to see if Colleen Hoover had any other books out and she didn’t. A few weeks later I looked again and the beautiful Point of Retreat showed up. I have to say that these books changed my whole reading life. I’ve always been a huge reader, but these books opened up a new genre of books that I never knew existed. 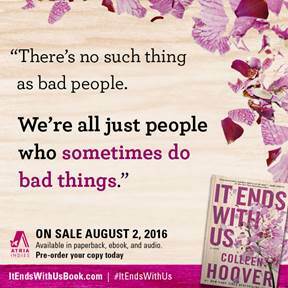 After reading Point of Retreat, I knew Colleen Hoover was something extremely special. Every book she’s released after POR I’d buy and read it without knowing any information about the book. And that’s what I think everyone should do when it comes to her books. Going into a CoHo book you know to expect originality and creativity. You know it’s going to be unlike anything you’ve ever read. And IEWU is no different. I won’t go into anything about the book, but it was powerful and eye opening. It was deep and intense and extremely emotional. . . but it still had all the humor and lightness you grow to love from a Colleen Hoover book. If you only read one book a year please make it this book. 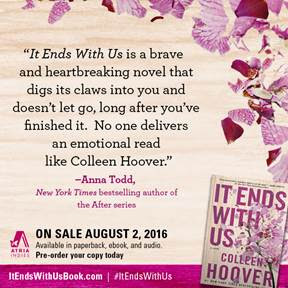 IT ENDS WITH US is such an empowering book. It deserves to be read.